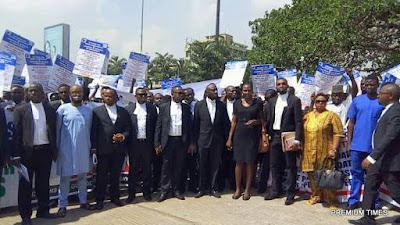 Lawyers in Nigeria have woken up from slumber against the regime of tyranny being carried out by Gen Muhammadu Buhari, the man who committed treason against government of Nigeria under Alhaji Shehu Aliyu Shagari on 31st December 1983 but later got rewarded in 2015 with presidency instead of punishment for committing the said treason. Since Gen Buhari committed treason in 1983, he has become an epitome of lawlessness and a ripple of saddism to Nigerians. Most painfully is that since May 29th 2015 when Gen Buhari was rewarded with presidency for committing treason instead jail he deserve, he has shown zero respect to the rule of law. His tyranny on Nigerians, especially indigenous people of Biafra, Shia muslims, leadership of Nigerian senate, and latest Nigeria judiciary has reached a crescendo. Gen Buhari's greatest breach of constitution of Nigeria which he swore oath of allegiance to protect and uphold is evident on his disobedience to court orders and verdicts. It is on record that Gen Buhari has never obey any court order or verdict which does not favour his ungodly yearning since he become president of Nigeria on May 29th 2015. It is against this obvious democratic tyranny of Gen Muhammadu Buhari in Nigeria that made lawyers in the land to say openly enough is enough. 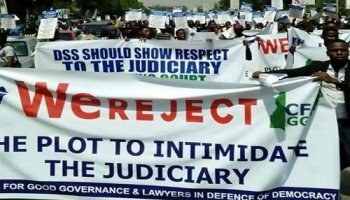 The lawyers took the street of Abuja the capital of Nigeria to protest against Gen Buhari's regime of tyranny in Nigeria on 31st October 2016. The lawyers said verbatim that DSS, the Gen Buhari's hunting mad dogs must obey all the existing court orders hanging on their neck which chief among the court orders is the unconditional release of Mazi Nnamdi Kanu, the leader of Indigenous people of Biafra. It will be recalled that the regime of disobeying court orders started on December 17, 2015 when a Federal High Court presided over by Hon Justice Adeniyi Ademola passed a verdict that Nnamdi Kanu be released unconditionally by DSS on the want of sufficient evidence and substance on terrorism charges against Nnamdi Kanu. Since December 17, 2015 when the verdict was passed in federal high court, Nnamdi Kanu has never been released and he is not standing another trial, thus amounting to flagrant contempt to court verdict aided by number one citizen of Nigeria. Although, at first the lawyers kept mute because Nnamdi Kanu, a Biafran agitating activist is involved but I continued shouting on top of my voice that "any injustice anywhere in the world is a threat to justice everywhere in the world" but those lawyers kept mute then. 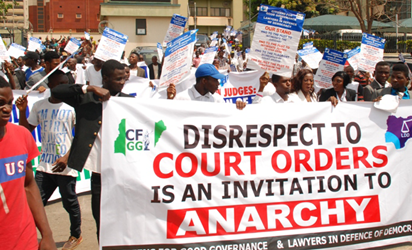 However, Nigerian lawyers are now telling Gen Buhari that enough is enough in his tyrannical democracy in Nigeria. There is no type of lawlessness that Gen Buhari has not committed in Nigeria whether by dereliction, conduct or negligence. The only thing that will force Buhari and his mad hunting dogs called DSS is to shutdown judicial services in the land by National Judicial Council pending when all the court orders are obeyed by Gen Buhari and his mad dogs. Courts cannot continue to give orders and verdicts whereas the previous ones have not been obeyed. What beat my imagination is that some judges in Nigeria is still been used by Gen Buhari to continue his ungodly bidding. Justice Binta Nyako of federal high court, Abuja through her body language is going to be another willing tool in the hand of Gen Buhari as he is going to continue on his ungodly bidding against judicial process. Will Justice Nyako continue in the bidding of the ungodly yearning of Gen Buhari? November 8 is going answer the question as we are going cross our fingers in observation. Finally, every Nigerian should stand in solidarity with the lawyers and demand the DSS to obey court verdicts and orders hanging on their neck. Yesterday it was Biafra agitators tasting the venom of Buhari's tyranny, today Nigeria judicial process is tasting it. Who knows who will become the next victim of his tyranny tomorrow? A question of the millennium that is only that can answer.